This is the story of two remarkable families, eventually united by the author's parents' marriage in 1935. 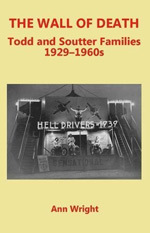 Twelve members of these families were Wall of Death riders and owners from 1929 to the 1960s, several of them among the first wall riders in the UK. The introduction of the Wall of Death into the UK in July 1929 caused a sensation and it became extremely popular with the public thereafter. The Todd and Soutter shows toured all over Britain and Europe, as well as Abyssinia and Persia, and were seen by British and foreign royalty, Hitler and Mussolini, and thousands of the general public. They appeared at the 1930, 1952, and 1953 Munich Oktoberfest, the 1938 Glasgow Empire Exhibition and the 1951 Festival of Britain. Their feats and trick riding were outstanding and included towing a roller skater on the wall, riding the wall with lions in a side car and the 'Race of Death'. These spectacles were photographed and reported on throughout the period by local, national and international press. They were interviewed on radio, and films by Shell-Mex and British Pathé News were shown in cinemas and on BBC television.